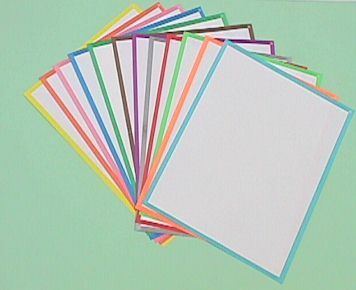 Our colored border paper is a great alternative to fully colored paper. With the ink only on the outer edge of both sides of the sheet, our paper will fax, scan, and copy clearly. All sheets are printed using soy-based inks on 20lb paper made with recycled content. Sold only in packages of 500 sheets. This is one of our more popular items because of it's simplicity and versatility.